Back in May we held a competition asking for UAL alumni to submit designs that celebrated the spirit of UAL, and the impressiveness of its global community. We are delighted to announce the winners are Huong Anh Trinh and Verity Slade. Anh, who has just graduated from a BA in Illustration & Visual Media from London College of Communication, is originally from Vietnam. She is now going on to study MA Children’s literature and illustration at Goldsmiths. London based Verity graduated in 2015 from MA Visual Arts: Illustration at Camberwell College of Arts. Since then she has worked on high profile design campaigns for the Barbican and Lena Dunham’s Lenny newsletter, to name a few. 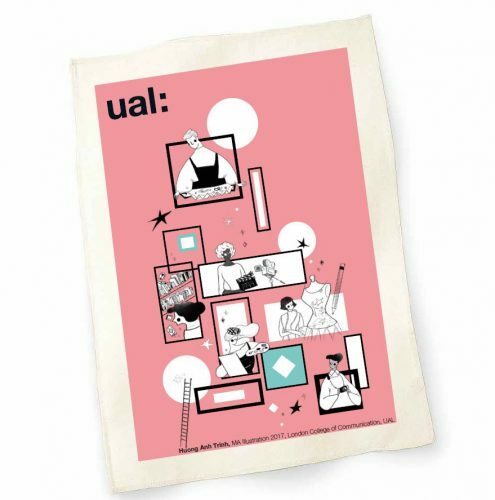 The winning designs were printed on a range of UAL alumni merchandise, which was launched at this year’s graduation ceremony at the Royal Festival Hall in London. The designs went down a storm, and we will continue to distribute them at upcoming alumni events across the globe. I didn’t contribute much to UAL in the first three years I was there, so in my final year I wanted to be more involved. I entered and won the UAL teaching awards, run by the students union. This spurred me on and gave me the confidence I needed to enter the alumni competition, and couldn’t believe my luck when I discovered I’d won that as well! Now that I have graduated I am going to study a MA Children’s literature and illustration at Goldsmiths. What I am going to miss most about UAL are all the activities – the clubs and societies, libraries and workshops. That’s what inspired me to create the graphic for the competition. It was brilliant when I found out I had won. I was always very shy, and when I told my tutors I had won they were really pleased for me. They said they have seen me come out of my shell and contribute in a positive way. Winning this competition has been a really big step for me. What was the biggest challenge you faced while studying for the BA? I didn’t face any big challenges in my learning, but I did find it hard to blend in. I was really shy and afraid to talk to people. Entering the competitions and going to new workshops became a great way for me to interact with people and build up my confidence. What is your happiest/best memory? When I look back at my time at UAL I am thankful for the combination of my tutors who were so kind and knowledgeable, and the opportunity to meet so many diverse and different people. One of my happiest memories is the opening of the summer show. Seeing all my colleagues there with their friends and family made me realise how privileged I was to be a part of this amazing shared experience. And what advice would you offer to students coming to UAL this autumn? The best piece of advice I would give to students is to take full advantage of all the UAL facilities. I already miss the workshops. UAL is all about developing your practise, so try everything from the beginning and learn about yourself. I waited until my last year to try things, and I wish I had started earlier. What made you apply for the UAL alumni competition? I saw the competition on the UAL Alumni Instagram and thought it would be a good thing to enter. I liked the brief because it was quite specific and I needed to create new work for it, it was a nice challenge to get stuck into. The design is based around the shape of a pupil in an eye, and then the kind of thought processes that swirl around your mind when you’re thinking about creating work, or looking at work. The text is a kind of circular question, it came from thinking about how I approached work when I was studying for my MA, and the motivations for certain choices or directions you take with your work. It also has the positive mantra of ‘why not try’, as it’s important to take risks when you’re studying because there are fewer opportunities to do so once you’ve started working. How did it feel to find out you had won, and then to see your image on the alumni bags? It felt awesome! The bags have come out so well, the design fits really well on them and I’m stoked to know that they’re being handed out at all of these UAL events. You can read more about Verity and what she has been up to since graduating here. Find out more about the UAL Alumni Association.